It’s been a while since I made a pure metrics post, I’ve been focusing on writing and editing, rather than writing about writing and editing, but I recently passed a milestone that I thought was worth talking about. On 30th June 2013, I sat down and decided I would write every day, and I haven’t missed a day since – which means a couple of weeks ago I hit the two year mark of my writing streak. So, what does 2 years of writing look like? To save you getting your calculators out, all those spiky lines add up to 535,588 words (366,065 of which were shiny new stuff, the rest were revisions). I spent 37 days, 14 hours, 56 minutes of my life writing those words. That’s 593 words per hour overall but that rate increases to 790 words per hour when I’m writing something new. This graph shows how I split my time between outlining, writing new words, rewriting old work or revising. It’s pretty clear from that what I’ve been doing for the last few weeks – revising. That’s good though, one of my goals for this year has been to revise the almost finished stories and novels I have kicking around. That’s almost done, so I’ll be back to new words in a few weeks. 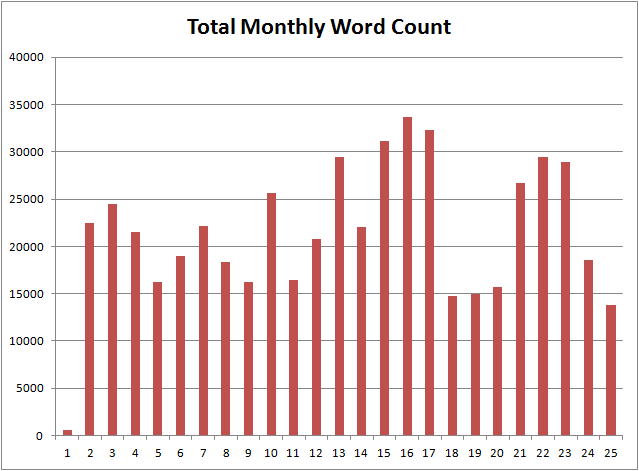 The scale on the graphs is getting a bit ridiculous so here’s the monthly word count graph (the first month is weird because this is based on calendar months and I only wrote for one day in the “first” month). A peak of 33,637 words in a single month isn’t too shabby. That would put my output at a first draft every couple of months. I’ll have to see if I can hit that sort of rate more consistently. Again, you can see the effect all this editing is having – I only wrote 13,821 words in that last month. Numbers are all very well and good but what was I actually writing? That’s 9 novels, 1 finished and 4 of which that are just me tinkering with ideas that probably won’t go anywhere. Of the 29 short stories, 19 are finished and there’s 3 novellas (1 finished and available now from Amazon). I’m still pushing to wrap up most of those shorter works although one or two will probably be abandoned, at least for now. The short stories marked with a * were exercises from writing workshops and will be staying on my hard drive. The next step is to get that writing out into the world. Generally, I submit the short stories to magazines and websites for publication, but I might put together a collection at some point next year. I haven’t decided either way yet, collections don’t really sell very well. I’m still working towards a pretty aggressive publication schedule for the novels. 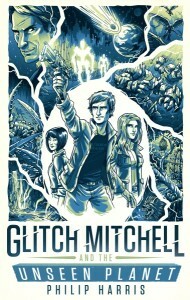 Glitch Mitchell and the Unseen Planet is complete and is going through the final proofreading and formatting stages. That one will probably be out first. Next up will be my Apocalypse Weird novel – Siren’s Call. As I mentioned yesterday, that’s with Ellen Campbell, the Wonderment Media editor. We don’t have a definite release date for that one yet. 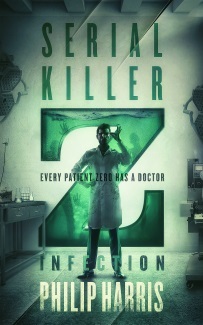 Then it’s onto The Zombie Book (working title). I’m just working through the third round of revisions, and then I need to find the right editor for it. It’s the first in a series, and I’m hoping to have it done before the end of the year. I’m really happy with how it’s turning out, and I’m already working on the sequel. I still have my standalone science fiction novel, The Ghost Smuggler to finish up as well, but I’m not sure whether I’ll be indie publishing that one yet. I need to get the other books out of the way first. So that’s two years of writing by the numbers. Drop back on Thursday when I’ll be talking about how I’ve kept my writing streak going for so long. For a limited time, I’m giving everyone who signs up to my mailing list 5 free books, including a copy of my science fiction novel, Glitch Mitchell and the Unseen Planet when it’s released later this year. Click here to sign up and get your free books.